Our template guides you through project management best practices for marketing teams so you can get from strategy to tactics to results. There are thousands of tools helping marketers craft their work and measure outcomes, but what about a tool to plan and manage that work? Without effective marketing project management, teams lose time and productivity by reinventing the wheel in spreadsheets then reiterating the plan across dozens of emails and meetings. Instead, marketers can rely our project management template to kick off any project quickly, and manage it successfully with Asana. Create repeatable processes. Starting from square one with every marketing project plan leaves you open to wasting time and repeating mistakes. Our template gives you a clear process to get right to work. Collaborate in one place. Great work is hard to achieve if everyone does it in a different place. Asana stores all the steps, documentation, progress, and conversations around your work so it’s easy to find and in one place and works with other tools you love. Get clarity and accountability. Without a tool like Asana, it’s hard to understand who’s responsible for what and how it fits into a project plan or bigger marketing goals. Assign the template tasks with due dates so it’s clear who’s doing what by when. 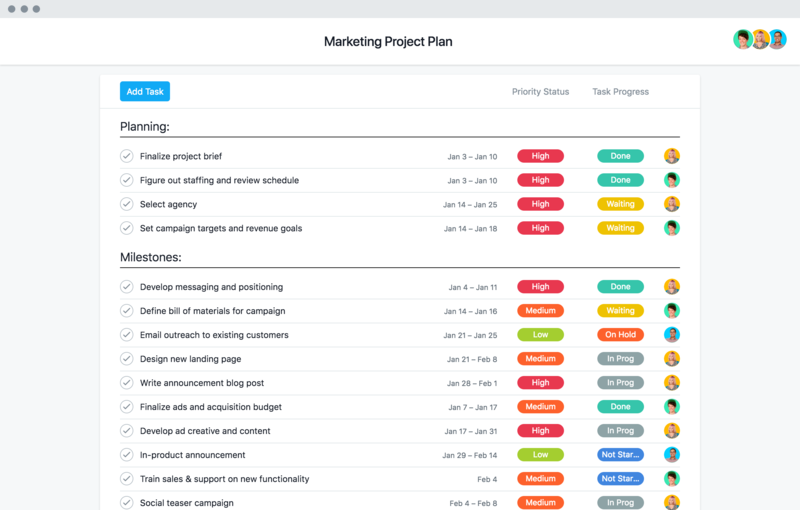 Asana helps marketers manage all the activities of their department. It does for marketers what Salesforce does for sales and what Workday does for HR. The best marketing teams run on Asana. Get the ultimate guide to create efficient processes that turn your marketing strategy into results. Find out how Basware scales their global marketing efforts to generate demand and leads. Get up to speed on project management and how it works in Asana with our short video tutorial. Learn to manage, plan, and deliver marketing projects like a pro with our in-depth online video course. How are thousands of marketing teams planning and achieving their goals to get an edge on the competition and market? With the power of Asana Premium.